Owning your own business is your life-long dream. You’ve invested many hours in getting it all together and you’re excited about its possibilities. You know your business – but you’re unfamiliar with different types of business structures. The business structure you chose determines how much you owe in taxes, which tax forms need to be completed, how you can raise funds and your personal liability – all vitally important issues for any business owner. It’s certainly not a one-size-fits all decision! Each business structure has its pros and cons, and the IRS has plenty of details on each. I’ll note a few highlights of each below so we can begin a conversation about which one is best for you. The simplest and one of the most popular business structures is the sole proprietorship. It has no separate existence from its owner. Pro tip: Consider obtaining an EIN (Employee Identification Number), which is a great way to reduce exposure of your personal SSN (Social Security Number). You can apply for an EIN on the IRS website here. 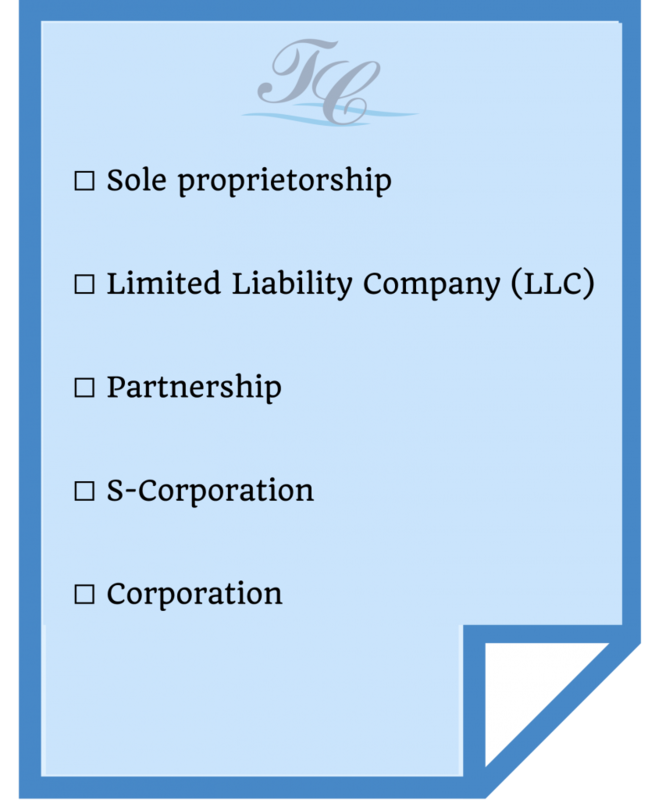 With an LLC, you benefit from the perks of both the corporation and partnership business structures, according to the SBA. While LLCs are a very popular business structure, it’s important to know that the pass-through tax treatment can be a double-edged sword. When profits are reported on your personal income tax return, you’ll be responsible for paying the self-employment (SE) tax. One option is to elect S-Corporation tax status, which is explained briefly below. As a Forbes article points out, if you opt not to be taxed as an S-Corp and those profits do pass through to your personal income tax return, you might wind up owing more than if you were taxed as a corporation. – A Single Member LLC is strictly a legal distinction. Taxes are reported and paid just as a sole-proprietor would. – A Multi-Member LLC is treated as a partnership and files a Partnership tax return Form 1065. – S-Election is common – in this setup, the business remains an LLC for legal purposes but an S-Corp for tax purposes. The two most familiar types of partnerships are limited partnerships (LP) and limited liability partnerships (LLP). Most states do not restrict ownership, meaning that members may include individuals, corporations, other LLCs and foreign entities. There is no maximum number of members. The IRS defines S-corporations as “corporations that elect to pass corporate income, losses, deductions, and credits through to their shareholders for federal tax purposes.” While an S-corp can offer small business owners many tax advantages, it’s also important to consider some important topics associated with this setup. One key topic surrounding S-corps is reasonable compensation. Even the IRS acknowledges that calculating compensation for employees and shareholders can be tricky. Of course, you’ll want to discuss your unique situation with a tax professional. Specifically, S-corps must pay reasonable compensation to its shareholder-employees for services provided prior to any non-wage distributions being made. The salary can be less than distributions – as long as it is reasonable. They however should NOT take distributions in excess of basis. The IRS has authority to reclassify other forms of payments to a shareholder-employee as a wage expense. As you may know, those wages are subject to employment taxes. One of the major reasons S corporations are attractive to business owners is because of the potential SE tax savings: SE taxes (Social Security and Medicare) are paid only on salary – not on the net profit of the business. This article offers some tax considerations if you’re wondering whether or not an S-Corp is right for your business. According to the Small Business Administration, corporations have an edge in raising capital by selling stock. So if your business is on the fast track to big growth, a corporation can be the ideal business structure. According to the IRS, shareholders of S-corps report the pass-through of income and losses on their personal tax returns. This setup avoids ‘double taxation’ of C Corp profits; shareholders are assessed tax at their individual income tax rates. Perhaps one of the most well-known benefits is that it offers the ability to avoid costly self-employment taxes. With an S-Corp, “owners” are, for tax purposes, considered “employees.” This avoids the self-employment tax consequences a sole proprietor or an LLC that has not elected S-Corp status might face. According to the IRS, an S Corp can have no more than 100 shareholders, it must be a domestic corporation and can have only one class of stock. Shareholders report income and losses on their personal income tax. You must file for S-Corporation status with the IRS. Confused By The Differences in Business Structures? It takes an experienced tax advisor to review your business needs and choose what business structure gives you the most tax benefits – and legal protection. Don’t ever let your business get ahead of the financial side of your business. Accounting, accounting, accounting. Know your numbers. Together, we can ‘know your numbers,’ and you can enjoy the road to success! I know how boring (not to mention stressful) anything related to taxes and accounting can seem to small business owners. It doesn’t have to be! Whether you’re starting a new business or ready to take your existing business to the next level, I’m here to help. Contact me today to discover how I can support you in your journey. Previous Post:Tax Extensions: To File or Not to File?